Just in time for off-season training, VeloPress is pleased to announce the release of Weight Training for Cyclists: A Total Body Program for Power and Endurance by Ken Doyle and Eric Schmitz. The book is now available in the U.S. and Canada in bookstores, bike shops, and online. Cyclists need more than just powerful quads and chiseled calves. Cyclists need total body strength-a strong core and solid upper body-to ride with power and endurance. Put simply, stronger muscles last longer and stabilize the body, improving technique and efficiency. Weight Training for Cyclists is the only book available that shows cyclists how they can get stronger to ride stronger. The authors explain how strength training in the weight room translates to endurance and power on the bike. New in this second edition are easy-to-follow drawings that clearly demonstrate strength training exercises. Doyle and Schmitz update exercises to include the newest weight training equipment and present the latest information from new research on core strength, nutrition, stretching, and warm-up. Weight Training for Cyclists presents a series of training plans that require only a fraction of the time that cyclists spend in the saddle. For newcomers and veterans alike, Weight Training for Cyclists will become their fundamental guide to better performance. Weight Training for Cyclists: A Total Body Program for Power and Endurance, 2nd Ed. 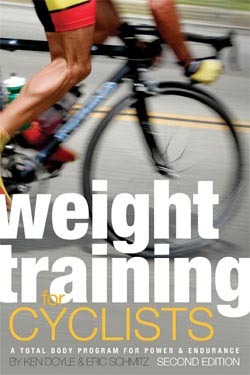 This is the only book on weight training for cyclists. Ken Doyle, a licensed coach with the U.S. Cycling Federation, is an exercise physiologist certified by the National Athletic Trainers' Association and the National Strength and Conditioning Association. He's a competitive road racer, coaches a road and a mountain bike team, and is also the head coach of the Santa Barbara Special Olympics Cycling Team. Eric Schmitz has a degree in Exercise Physiology and is certified by the National Strength and Conditioning Association, the American College of Sports Medicine, and the National Academy of Sports Medicine. He is a Level I USAT triathlon coach and the creator of two strength and conditioning DVDs.